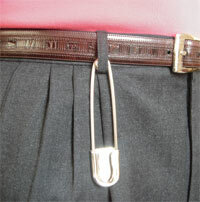 The “Safety Pin Cycle” springs to life at your report of findings when you have this 5" safety pin as a visual aid. It makes telling the chiropractic story easy! Trace your finger down one side of the pin. Trace your finger up the opposite side. In less than 30-seconds, you've explained the fundamentals of chiropractic in a quick and understandable way. Put it use in your patient communications today. Save when you buy two or more. A great gift idea! Save $2.50 when you buy 2 or more.